Cool bars in London aren't hard to come by. London is one of the best cities in the world for cool bars and pubs. The coveted View recommended list of cool bars in London will help you impress your friends with the tastiest cocktails in town and some real hidden gems. If you're looking for a good time, these cool bars in London are the way to go. JUJU is a cool venue in Chelsea with an extensive cocktail and drinks menu. Known for its great DJs, JUJU is an award winning late night bar. Belowzero Ice Bar is an innovative London bar constructed entirely from ice. The chilled interior and stylish, sculptured decor makes for a unique bar experience in intimate surroundings. Flight Club is a unique concept venue on Worship Street that combines cocktails, food and the classic pub game of darts using state of the art technology. Jack's is a stylish bar and restaurant that offers visitors an impressive international menu that is served within a friendly and sophisticated atmosphere. The Ladybird is a music and cocktail bar, nestled in the heart of Upper Street. 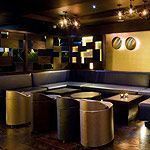 A superb selection of cocktails, accompanied by bottled beers, wines and spirits from across the globe can be enjoyed to the backdrop of funk and soul classics with DJs mixing it up on Fridays and Saturdays. The Nightjar is a speakeasy found in Old Street, they serve an extensive choice of signature cocktails and host regular music throughout the week. The Queen of Hoxton is a bar and live music-arts venue located in the heart of the East End. Rumpus Room is a relaxed bar and lounge within the Mondrian London at Sea Containers hotel. With impressive views of London, you can expect expertly created cocktails, Champagnes and decadent grazers, small plates and boards. Smooth jazz den for trendy north east Londoners. The Silver Bullet is located opposite Finsbury Park Tube station. They host regular club nights and live music events from a wide range of genres including acoustic, folk, electro, indie and rock. Ideally located 1 minutes walk from King's Cross station, Simmons is a popular late night bar serving cocktails in tea cups and sports funky decor. Designed by the team behind Mahiki, Sugar Cane is right up there as one of the coolest bars in London.